Obviously, there are more than 10 awesome traditions happening in the Big Ten. Iowa is known for it’s tailgating, Wisconsin is known for the students’ BAC level, and Ohio State and Michigan have one of the most bitter rivalries in football. Not wanting to list the obvious, I did a bit of hunting to bring you the top 10 most interesting (for lack of a better word) traditions around the Big Ten. Little Floydy is a bronzed pig that that Iowa and Minnesota fight to keep during the last football game of every season. History: Minnesota was accused of using rough and dangerous play during their 1935 meeting with Iowa. Iowa’s then-quaterback, Ozzie Simmons, had multiple bruised ribs and claimed Minnesota was kneeing him at any given point trying to hurt him. The next game was to be played in Iowa City, when the governor at the time threatened that if the officials stood for the dirty tactics, the crowd sure wouldn’t. Fighting words!! Luckily, Minnesota’s governor has a since of humor, and suggested they bet one Minnesota prized hog against one Iowa prized hog. Deal on. 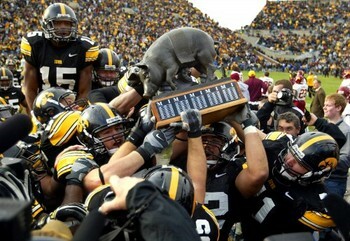 Minnesota ending up winning, thus Floyd the pig, from Rosedale Farms, was given to the Gophers. Since then, a bronze statue replica was made and both teams have carried on the tradition. These lovely pink cubbies are where the visiting football team has the luxury of hanging their things when they come to Iowa. History: The pink locker room is the brainchild of legendary Iowa coach Hayden Fry. Fry was a psychology major in college and claimed that pink had a calming effect on people, and therefore had the locker room painted pink. Mostly, he probably just wanted to psych people out. 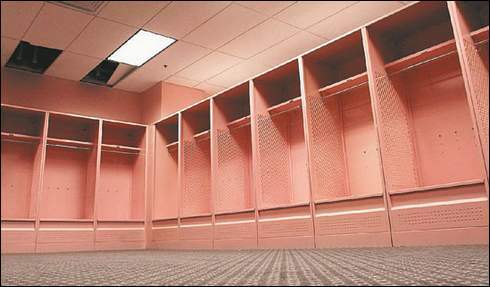 In 2004 when Kinnick Stadium was renovated, pink toilets, showers, and lockers were installed to match the pink walls. It caused a eff-ton of controversy and a few protests. People claimed that it reinforced stereotypes that women and homosexuals are “weak”. Well, the general public was like “Uhh whatever, it’s funny”, so it stayed. History: A page from Jim Tressel’s autobiography, due out this Spring. I don’t know quite what to say right here, I don’t remember much about myself. I ate the brown acid back at Woodstock and I haven’t been the same since. I still have a few more nasty drug addictions to go through, a divorce or two to fight out, two bankruptcies and an arrest for indecent exposure. I was born in the harsh desert climate of Van Nuys, California, in 1889 where I was abandoned and taken in by a pack of hungry native coyotes. Their first intention was to eat me, but the leader of the pack saw in me the potential to be a great hunter. By age 11, I was impressing the pack and local wildlife photographers with advanced carpentry skills. I built elaborate shelters for my family out of sand and dead scorpions. At age 15, while running away from a young coyote gentlemen who thought I was in heat, I ran my head straight into Charlie Sheen’s leg. He took me in, taught me English and simple hygiene and sent me to school. Luckily, I was what some people call a “genius” and caught on quickly. 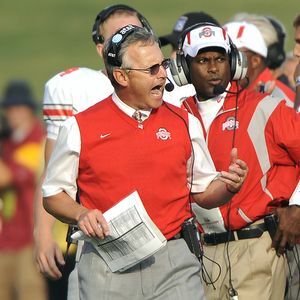 Now I coach football at Ohio State University (have you ever heard of it?) with the unique skills I learned whilst living among the coyotes. Years later, a doctor will tell me that I have an I.Q. of 48 and am what some people call mentally retarded. The Little Brown Jug Who Could is the coveted prize between Minnesota and Michigan. It’s one of the Big Ten oldest rivalries, and one that I had never heard of before. History: In 1903, Michigan was totes dominating the entire Midwest. But little did they know, Minnesota was quietly crafting some sort of Frankenstein team in their little corner of the conference. The meeting between the two teams was highly anticipated that year, and the Michigan coach, Fielding Yost, was afraid of their water being contaminated (a logical thing to think, yes?). So they went to the store and bought a $0.30 water jug. The game was a bit of an upset. Michigan scored six points in the first have, and Minnesota scored six in the second half. The fans got angry/antsy and stormed the field with two minutes left on the clock, forcing them to call a tie. Michigan went home….but forgot their precious water jug! Michigan’s coach wrote and asked for it back, but Minnesota’s coach said, “Sucka, you gotta win it back, son”. So they did. And a rivalry was born. Michigan was actually the first band to spell out Ohio in script form. But don’t tell Ohio State that. This was listed at the No. 1 college tradition ever of all time. History: When Ohio State’s band started spelling out Ohio in pretty cursive, they had to have someone dot the i. Usually, it was a trumpet player, until one day, the band leader told a sousaphone player to switch with him. Thus, now a sousaphone player dots the i.
I guess the spelling looks very straight and crisp and I doubt they have misspelled Ohio to date, but still. Any college level band should be able to stand in a straight line. Okay, so I didn’t think Herky was that big of a deal–Well, you caught me. His face is tattooed above my heart. But really, he’s just a mascot. Everyone has mascots (except Illinois, but I digress). It wasn’t until I read about lil’Herkz on a Top 100 college traditions list that things started to make sense. Turns out, he’s the most annoying mascot this side of the Mississippi. Hooray! History: Herky, short for Hercules, was dreamed up by an Iowa journalism instructor in the 1940s. He didn’t appear on the field until 1959, and that’s when things got tricky. He raised hell and pissed off every official from the dangerous stunts and stupid pranks he would pull on other mascots. Herky was banned almost immediately. That is, until 1962 when Larry Herb, a student in the Delta Tau Delta fraternity, brought him back to life in a kid-friendly, non-prank pulling way. That doesn’t mean that Herky should be messed with. In 1997, he threw a cup of waters into the face of a Minnesota drummer. The drummer tackled Herky, who preceded to punch him in the face and break his glasses (sweet). i have nothing sarcastic to say about this. Basically, Penn State’s White House is B.A. History: The idea of the “white out” was started in 1987 when a Winnipeg hockey team urged fans to wear all white against the Calgary Flame’s “C of red”. Inspired by this, Oklahoma State started a “wear orange” day in 2003 that turned out to be a wild success. Once again inspired, Penn State debuted a “White Out” in 2004 against Purdue. It went so well that they held one again the next week against Iowa. Now they hold one every year during night games and televised broadcasts. Honestly, I don’t know how Iowa played last year in Beaver Stadium during a white out. For some reason, the color white seems more intimidating than any other color. Also, everyone has a white shirt. Everyone. Not everyone has a bright gold shirt they can wear to Gold Rush games at Iowa. Paul Bunyan’s ax is the trophy between Wisconsin and Minnesota, and is the oldest rivalry in the Big Ten. History: The first game of the rivalry was back in 1890. There was no trophy then, but that didn’t mean the rivalry wasn’t bitter. In fact, the game was canceled in 1906 by President Roosevelt because of injury and deaths on fields all over the country. That’s how insanely heated the battle was. in 1930, a traveling trophy deemed “a slab of bacon” with an M or W on it, depending on you turn it, as made. Whoever won it was referred to as “bringing home the bacon”. How clever. It was stolen in 1945, and thus, Paul Bunyan’s ax was created. Now, this effer is huge, taller than me. The handle is six feet long with the scores of every single game written down on it. In 2003, they ran out of space and a new ax was created for another century of game play. Okay. So Chief Illiniwek, head of the Illini tribe–wait. There is no such thing as the Illini tribe. Because Illini is a completely made up word. It was made up by a student when naming the school newspaper, The Daily Illini. Therefore, Chief Illiniwek is a sham. Actually, the Illiniwek are a real tribe. In Oklahoma. Does that make sense? Let’s pretend for a minute that we are Illinois fans and we enjoy spending our free time obsessing over the chief. And oops, he’s taken away in 2007 because he promotes the “hostile and abusive” stereotype of Native Americans. Also, the Peoria Tribe, the closest living descedents of the Illiniwek Tribe, basically called out the university for being ignorant. According to the ACTUAL chief of the Peoria Tribe, the costume Chief Illiniwek wears is Sioux. Good job on that one. The tribe even blessed the use of Chief Illiniwek until after five years of attempted contact, the university wouldn’t respond. Anyways, what I’m trying to say is that Chief Illiniwek is a stupid mascot and I don’t miss him. He didn’t even do anything cool. He pranced around doing a dance that can’t even be described as somewhat historically accurate. Now take Chief Osceola, the mascot for Florida State University. He was blessed by the Seminole Tribe in Florida, and was an actual chief of that tribe in the past. And he doesn’t dance. HE THROWS A FLAMING SPEAR WHILE RIDING A HORSE. Seriously, this is one of the coolest things in the entire world. I saw this phenomenon happen with my own two eyes last year when I went to Madison for the Iowa/Wisconsin game. Even if the Badgers are losing 64-0, they still jump around like Larry Bird on some sort of steroid/ecstasy bender. History: During a 1998 game against Purdue, neither team had scored in the first three quarters. Needless to say, people were getting antsy. For no rhyme or reason, the sound guy decides to play “Jump Around” by House of Pain and the entire stadium went nuts. Now, the song is played before the 4th quarter every game, and word is the press box bobs up and down from the jumping.